The coming of spring demands a great deal of concentration when you live in an area that is frozen half the year. For April and May this has meant new projects progressing, outside interests fighting for attention, and the progression of older projects resulting in resolution of old issues. Unfortunately, due to the fact that there are those who feel it is their right to knock off ideas they find from others without attribution or recognition, I am struggling with how to proceed with this effort going forward. I enjoy exploring new ideas and sharing discoveries. I despise finding the results integrated into others offerings without so much as a nod to its source. That said, for this installment of the 12 in 12 project, I focused on making progress in development of portable light originally introduced in the 52 in 52 project in 2010, and a spring project that is personal and fun. The Test Mule passes 12 months in continuous operation. In the process of building Tasca, there has been numerous iterations, prototypes in metal and plastic, tests to failure, drop and impact tests, electrical and electronic tests, and lighting application tests. 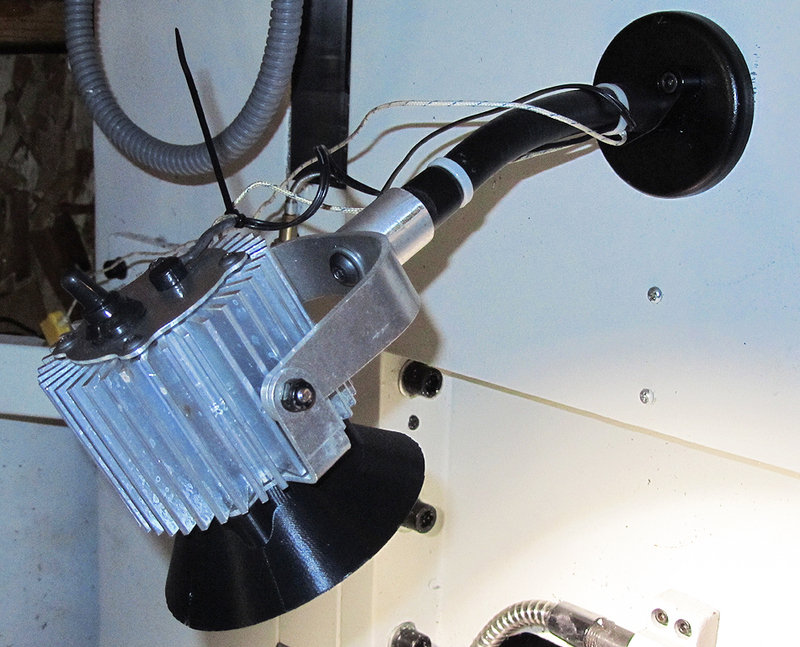 As we found what worked, and what didn’t, and collected tooling for components, like the heat sink, I build the first functional products, using production level components. The first one made was what we affectionately call the Mule. It has been lighted 24/7 for one year as of the end of March, or a total of 8,841 logged hours to date. In that time it has been tested under operating conditions, attached to the side of a milling machine head, sprayed with lubricating and cleaning fluids, dropped, dunked, draped with rags under high ambient conditions, and frozen. As shown in the images here, this head has had a few hoods and shields attached to test effectiveness, and the mounting adapter has been changed a couple of times as I’ve experimented with the machined attachment hardware. This head has a thermocouple lead installed, so at any time I can plug it in to see what the temperature of the LED is, while there has been numerous output tests to check lumen depreciation, which has been less than 1% to date, right on track with the LM80 data for the LED (Bridgelux ES array). To operate, the wheel is spun with the thumb and forefinger at the center knob – with the color wheel exposed to the lighting condition being tested. Can be used to look at light falling on a task surface, or isolated to a single light source. No Flicker Condition: When you spin the wheel under daylight or a non-flickering lighting system or source, the Red-Green-Blue bars will blend together to create a dull grey appearance to the spinning wheel. As the wheel is spun faster, this will become smoother, with no color apparent at all. If you see any color at all, you are experiencing flicker of some level. 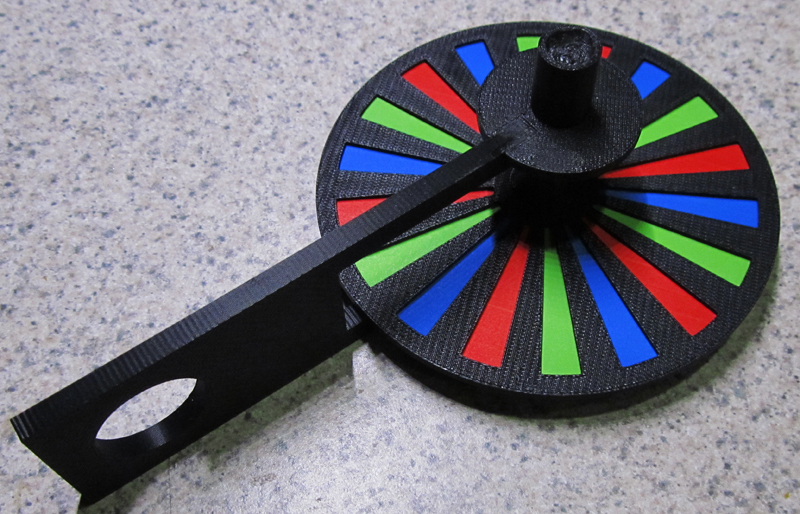 Only with a total lack of flicker will the wheel appear to be uniformly gray in color. The best place to see this is under direct sunlight, as this will present no flicker at all. Noticeable Flicker: When you spin the wheel under a flickering light source, there is a whole kaleidoscopic of effects that appear. The most notable is the appearance of a rainbow color wheel effect, as the R-G-B regions are blended in strobe effect, that will be very wide at high speed (including the appearance of secondary colors Yellow, Magenta, and Cyan that are not on the wheel at all), to very narrow at low speeds. You will also notice that the radial patterns change in direction from clockwise to counter clockwise as the wheel speed changes. Further, at intermittent speeds, the color regions will turn gray with black wagon spokes, then change back to color at higher. In other words, you will be exploring the world of flicker effects in strobing both light and color, as the wheel is changes in speed. This effect will change both with time and wheel speed. At low frequencies (60Hz for example), the color bars will be very wide, as will the wagon spokes. As the frequency goes up, the width of the bars will be narrower for the same wheel speed. I thought a lot about what to focus on in 2012 for this series, and decided that I had plenty to share from regular activities of Lumenique, LLC and Tasca. So, the plan is to select something completed in each of the 12 months of 2012 and feature them here. This will generally be products or projects completed for customers, but may also include a report on research work in process, when it adds value. 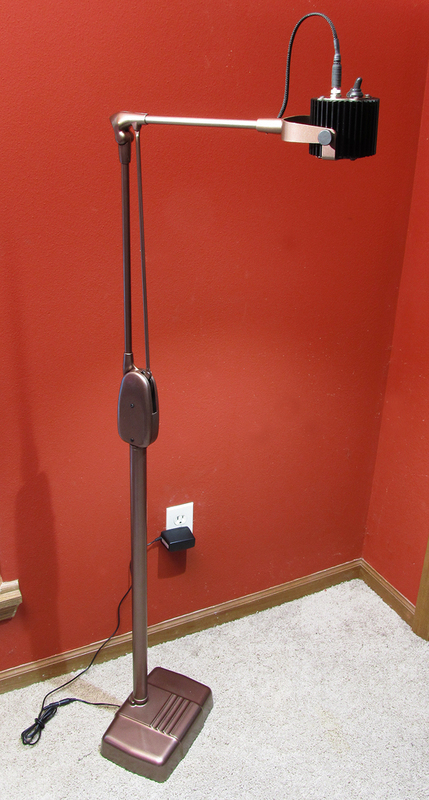 This is a refitting of a Dazor table lamp, applying the TASCA lighting head, and adding an extension stand to convert a desk lamp to a floor lamp. 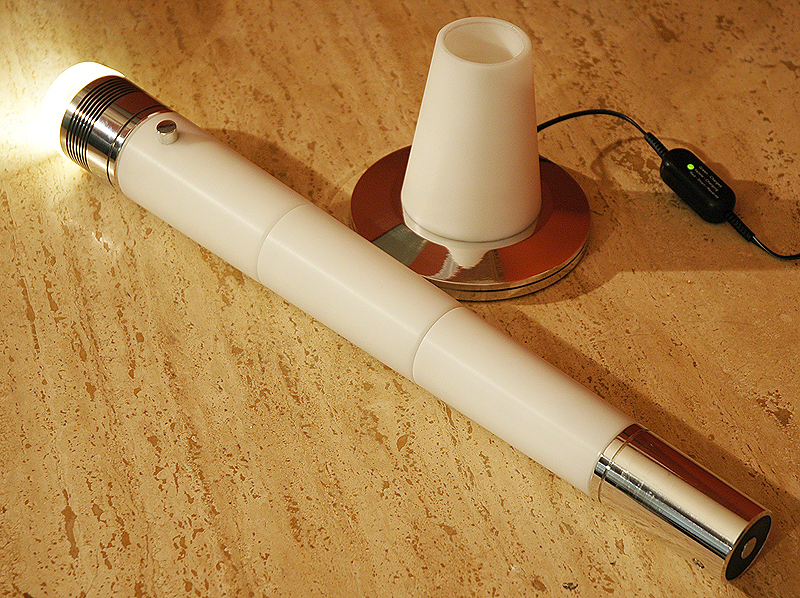 The product was commissioned by a customer who provided the table lamp, purchased used. From the GSA and other government markings present on the original, it was obviously from a government facility. The table lamp made by Dazor has been around since the late 1930’s, where the fluorescent lamp version graced the GE display at the Worlds Fair. For more details on this project, check out the summary and full technical specs at Lumenique 12 in 12 for 2012 – January. For additional details on how you might procure a similar product from one of your own favorites, visit TASCA. Also, as an update, the Lumenique Product Center now accepts all major credit cards, making your purchase experience easy and secure. Stay tuned for additional news and updates on the 12 n 12 for 2012 review, and other interesting SSL information.